Posted on September 15, 2014	by A.J. In Part 1, I covered how I added an air-tight fan (well I have not yet published the mechanical details) to the PPD60PV-T2 and that reduced the variability of the particle count by a large amount. In this post, I will compare the output of the T2 with and without the fan to the Shinyei AES1 (aka PMS1). The latter is a PM2.5 sensor i.e. gives output in ug/m3. The T2’s output is in volts or pulse occupancy which can be translated into PCS which is particles per 0.01 cu ft. So I connected the 42 and the T2 to an Arduino Uno and used the interrupt function to measure the low pulse occupancy and the A->D function of the Arduino to measure the analog voltage (only for the T2). Every 30 seconds I printed these measures to the input USB port of a raspberry Pi which then posted to the net. In the case of the T2 with the fan, I built an acrylic case, housed the sensor+air tight fan and sent the data directly to the net using an Arduino Ethernet. The AES-1 has its own Ethernet board which also connected to the net, but then it sent the data only to a Windows computer (I had to borrow one from my Dad as I has not really seen one before). So, here is the plot of the T2, T2 with Fan, Dylos (ignore for now) and the AES. This was for one day. The vertical axis is really a straight line scaling of the raw output from the T2, except for the Dylos when it is the actual reading of the small particles. 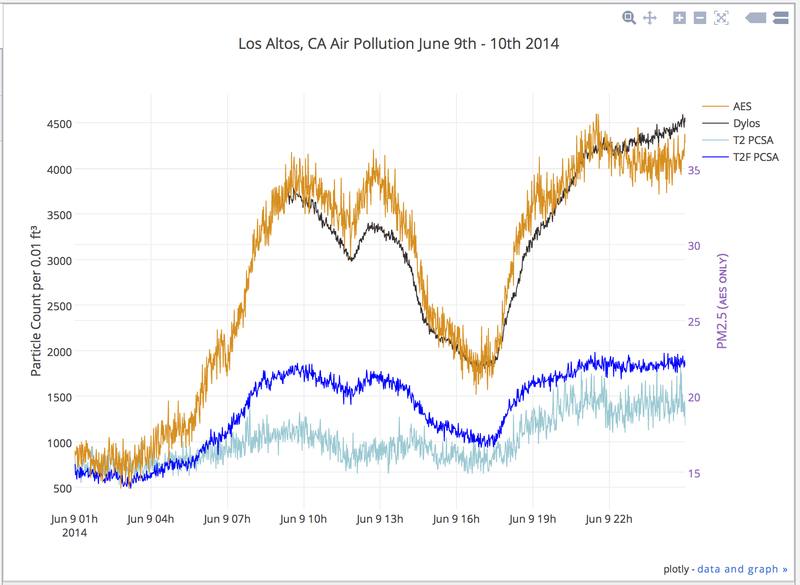 The plots are using plot.ly which reads the data from TempoDB via a python script. And here are the correlation plots, first without the fan. The R2 is 0.57, not too bad but not great. So from here (ignoring the y-intercept), one can take the T2 reading and divide by 27 to get the PM2.5 reading. But things significantly improve with the T2 and fan. Now the R2 is 0.96! So the simple addition of a fan made the T2 become a much better sensor for measuring PM2.5 by measuring the scaled voltage and dividing by 60 (ignoring the y intercept). Also the T2 with fan is more sensitive than without the fan. Next I will post the mechanical details of how I added the fan. This entry was posted in Uncategorized and tagged AES-1, air pollution, PM2.5, PPD42NS, PPD60PV, Shinyei. Bookmark the permalink. thanks for your research. Please post the fan modification, will this work for the PPD42NS as well? I will be posting my fan mods this weekend. And yes this will also work with the PPD42NS.